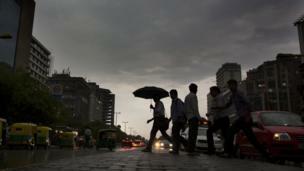 Rain hit the Indian capital Delhi, bringing some relief from the country's current heatwave. 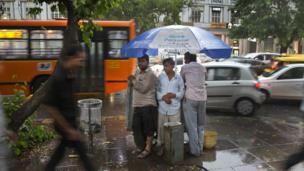 After temperatures soared to a record high of 51C last week in India, Delhi finally got some respite from the heat. 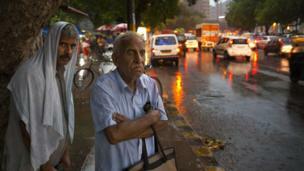 Indians took to the streets to enjoy the rain, which brought temperatures down from 42.7C to 40.9C. The country's heatwave has left many villages and towns without regular water and is thought to have affected at least 330 million people, with this number set to rise. The run-up to the monsoon season typically sees strong sunshine and increasing heat but temperatures have soared to higher than expected levels this year. 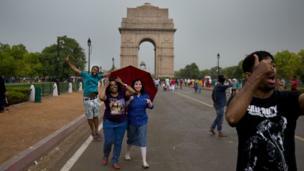 The shower has temporarily eased temperatures, though permanent relief from the heat is only expected in mid-June when monsoon rains bring cooler temperatures. 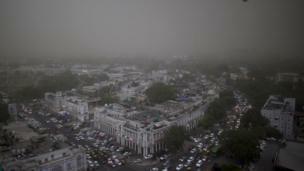 Delhi was left enveloped by cloud and sand after the dust and rainstorm.